It was on this day in 1997 that New Jersey Devils goaltender Martin Brodeur scored during a playoff match-up against the Montreal Canadiens. With that goal, he became just the second goalie in NHL history to score in the playoffs. During Game One of their opening round playoff series against the Canadiens, the Devils found themselves leading by a score of 4-2 with less than a minute remaining in regulation. That two goal lead allowed Brodeur to take a chance and shoot for the Habs’ empty net, and he would capitalize on that opportunity, as his shot eluded the six Montreal players before crossing the goal line and giving his Devils the 5-2 lead. New Jersey would go on to win that series, but they would lose to the New York Rangers in the following round. 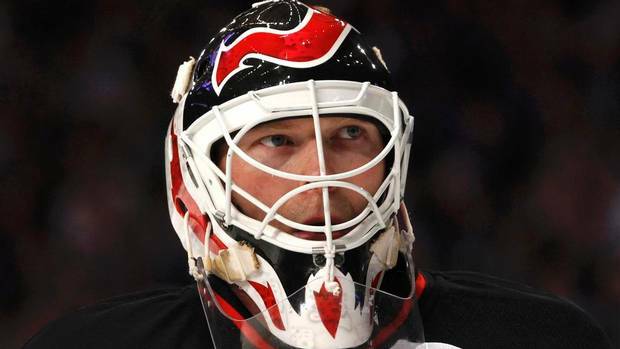 Three years later Brodeur recorded the second goal of his career during a regular season game against the Philadelphia Flyers, tying him with Ron Hextall for most career goals by a goaltender. And in 2013, he was credited with the third goal of his career during a game against the Carolina Hurricanes. Here is a look at Brodeur’s playoff goal against the Montreal Canadiens.